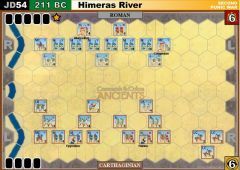 After the battle at the Ticinus River, Hannibal soon faced an entire Roman army under the Consul Sempronius. As vain as he was inept, Sempronius wanted a victory to finish our his year as Consul. He took no cautionary advise from the wounded Publius Scipio, but instead sent his army, cold and hungry, through the icy waters of the Trebbia to engage Hannibal's army on the far side. Hannibal had prepared the first of many traps for unwary Romans - he had placed his brother Mago and a picked force of cavalry and infantry out of sight in a ravine. The Romans did not discover them as they passed by. 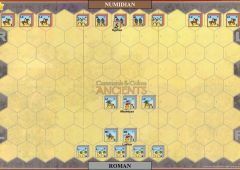 Despite their cold and hunger, the Roman infantry was doing well against Hannibal's main line. Then twin disaster struck. Mago's detachment emerged from hiding and struck the Romans from behind, and the weather turned markedly colder. Assailed from two sides, and now literally freezing to death, the Romans broke. Many died trying to recross the Trebbia. 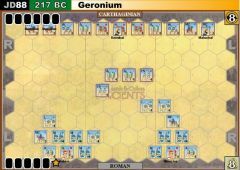 Sempronius's army of two double legions was effectively destroyed. The River Trebbia is fordable. 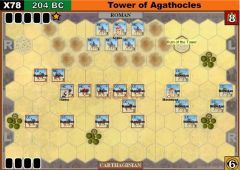 Mogo's ambush may be ordered by playing a 'Leadership' card after the Carthaginian first turn. as the first hex of movement for a unit this turn. 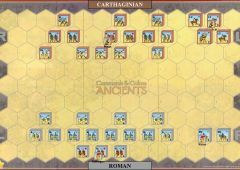 Should these units have to retreat, they must retreat toward the Carthaginian side of the battlefield. Played this scenario with my usual sparring partner, John Mitchell, last Wednesday (12th September) as John fancied a battle with elephants. 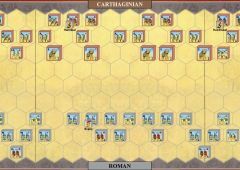 Plus, this scenario has some interesting elements, particularly the possibility of the Carthaginian ambush, given the right card. 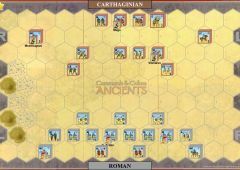 A random selection gave me the Carthaginians to start. 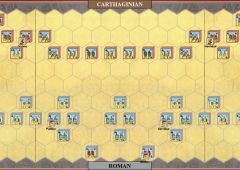 The Carthaginians have some slingers out front, so I started shooting at the Romans. John advanced his centre to come to grips with them, but I was able to skip out of the way (a very useful Move-Fire-Move card) and engage his advanced troops with my centre - getting my heavy infantry into the fight. While the main fighting was in the centre, there was some skirmishing on the flanks - where John took out some cavalry with his own horsemen only to lose them to my lucky dice. The elephants on my left flank got involved but to no great effect. 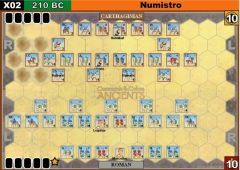 As the Carthaginians closed in on victory, I finally got a card that would let me spring the ambush. However, I used it to attack with my right flank forces and take out some Roman light infantry for the win: 7 banners to John's 3. Swapping sides, we played again. 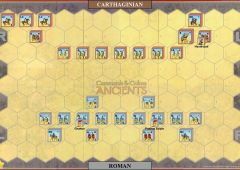 I used a "Line Order" card to advance the entire Roman line (apart from the cavalry on the flanks), closing on the Carthaginians and putting some space between my army and the potential ambush. Missile fire from John was followed by a "Line Order" from him, which I was able to copy with a "Counter-attack". Another one would have seen both armies engaged right along the line. 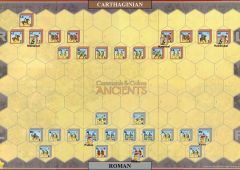 Instead I attacked along the line from the right, with my medium infantry in the centre being particularly successful in damaging Carthiginian units, which John then retreated. John threw his left flank elephants into the fray only to see them go down from some more lucky dice. 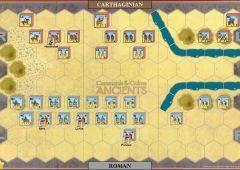 Then he sprung the ambush, taking out the left flank Roman cavalry, which hadn't moved. 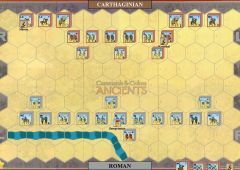 The Roman line finally broke up, with left and centre troops shifting back to tackle the attack in the rear. At this point John was ahead 6:5, with just one more banner required. 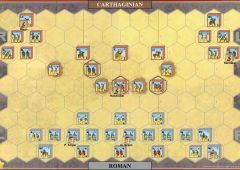 However, my medium infantry was still attacking in the centre and got through to the weakened units hiding behind the Carthiginian line. 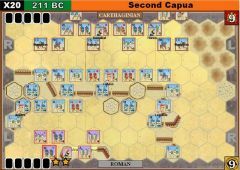 Finishing off two of these in one attack gave the Romans a close win 7:6. 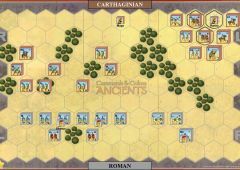 This was despite the Carthaginians having a solid formation holding half the battlefield while the Romans were scattered all over it. 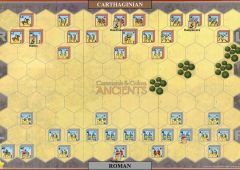 A very tight battle, with the Romans taking a 4-0 lead thanks to destroying the Carthaginian center and Mago's total flaw in his ambush, which led to an almost destruction of his force. 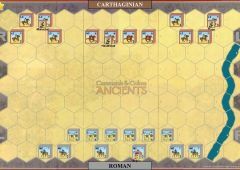 Hannibal then took the lead and advanced with the heavies and some auxilia to destroy the Romans in front of him. The score advanced to a 5-5 and then Hanno advanced his light cavalry to lead an infatry attack on his side to advance to 5-6, and finally the cavalry interdicted a light unit previously routed for the win. It could have been any way, very intense game. 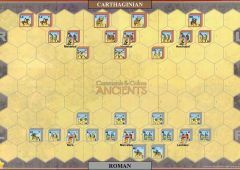 Carthage ruled the Romans in 80 percent of the battle. The Romans moved forward half-heartedly, but thus exposed themselves to deadly fire from the Iberian slings. 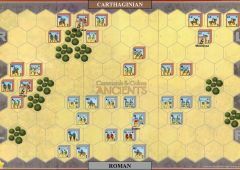 Mago did not waste a long time and took the Romans from behind in the Roman left side. 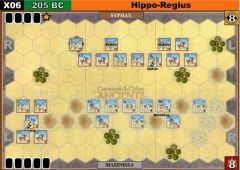 Almost all of the Roman left broke together, but Mago's ambush force was also almost completely unraveled. But then, the fickle girl, Fortuna, turned again. 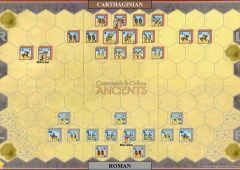 Sempronius finally took some initiative and moved the remains of Roman infantry units forward. 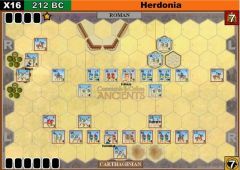 Sempronius' own unit succeeded with a single attack to erase a whole auxilia unit. 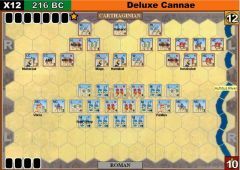 In the ensuing bloodstorm, Sempronius then cut through most of Hannibal's heavy infantry. 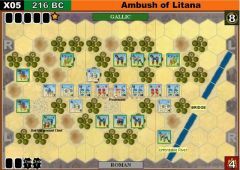 The unit broke down and the Romans even killed Hannibal in the subsequent, decisive charge. What a comeback. The Romans turned a certain defeat to a very hard-won victory. 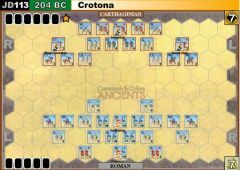 It is hard to criticize the Carthaginian general who made good use of his strong cards. 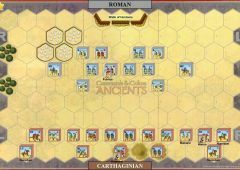 The Romans, however, did make use of some desperate moves (such as to taget the the elephants and cause them to rampage), and eventually it was Fortuna's wet kiss that saved the destiny of the Republic. The other battle of the Trebbia River was a little faster. 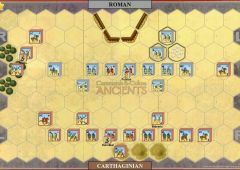 The Romans played very aggressively in the middle and Sempronius quickly moved forward. 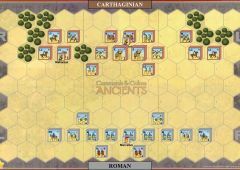 It was not a completely flawed strategy, especially since the Carthaginian light infantry was busy with * almost * shooting a Roman auxiliary unit to pieces. Rome took a lead of 4-1 banners in this initial phase. 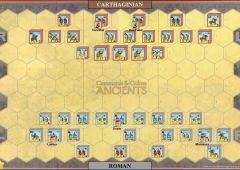 The bloody slugfest in the middle became even bloodier when Hannibal and Hanno moved in with the Carthaginian heavy infantry. The exhausted forces moved apart with equal loss. But then the Carthage General let loose his elephants and quickly wiped off the weakened medium-tongue and heavy Roman legions. Sempronius himself also fell to the dreaded beasts. 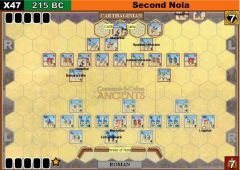 The Roman General tried to turn the tide with a few bold and heroic maneuvers on both wings. Among other things, he got revenge for his fallen brothers by killing one of the elephant units. But the final cavalry attack ended with tragedy for Rome, as a light infantry unit stood fast and then killed the brave Roman riders. 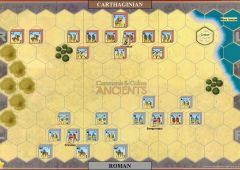 Carthage won the battle - even without Mago's ambush attack ever taking place. Two games yesterday. First game 7-4 for Carthage. 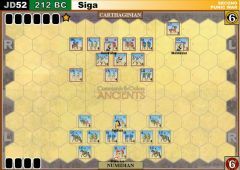 Mago took the day with savage strike to the Roman right flank. 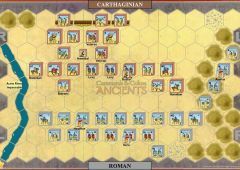 Other notable things were elephants dying without accomplishing anything and Hannibal's valiant stand with his medium infantry (he lost his starting heavy unit quite early but survived) against three Roman units inflicting heavy casulties which when Mago showed up sealed the game. Second game 7-4 for Rome. 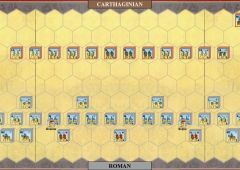 No reinforcements (Carthagian player used up the only "Leadership" card for other part of the battlefield and didn't get another) which made life much easier for Romans. Again elephants were ineffective (did some damage but died early). 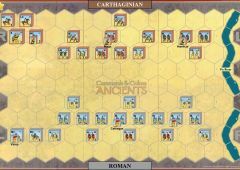 Carthage disrupted Roman left flank but Romans destroyed Carthagian center and right flank. 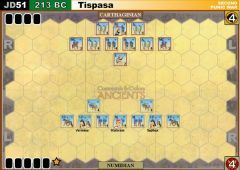 Tense game; if Mago showed up it would've been really hard and risky for Romans to advance, but I guess they should take that opportunity if it presents itself. 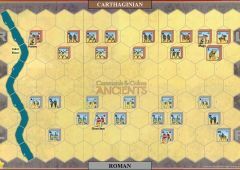 Notable plays: two Carthagian LC creating havoc in Roman left flank and getting behind Roman lines. 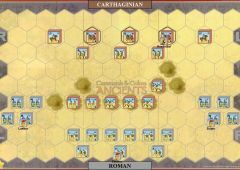 Sempronius and his mediums, flanked with heavies and other mediums cutting through Carthagian center toward right flank. 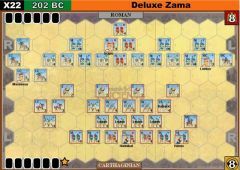 Roman light infantry having godly aim, wounding elephants and heavies. Close game, Carthage 7 Rome 6. Rome marched up the middle taking out the Light slingers. The Carthage Light mounted also suffered. Mago turned up just in time to hit the Roman right. 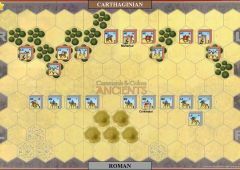 The war elephants were released on the Roman left, which did some damage, but when the elephants rampaged they killed Hanno, handing Carthage a bitter death. 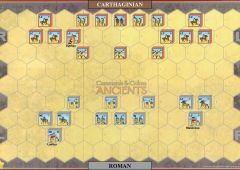 Rome could not crack the Carthage center, and became disorganized trying. 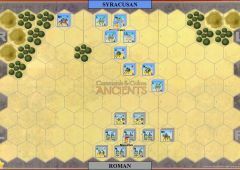 Mago and his troops were able to take out several Roman weak troops including the Roman Heavy. 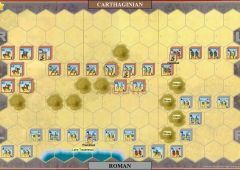 In the end, the Romans pushed the Carthage right all the way back to the edge, but could not close the deal. Carthage took the final banner in a very close win. 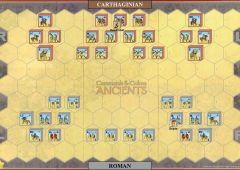 7-4 for the Carthaginians. 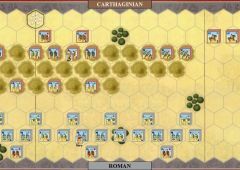 Unlike my previous playthrough of this scenario, the Romans were never really able to get on track with any sort of consistent offense on the flanks. 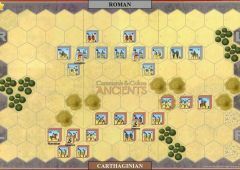 Instead, they allowed themselves to get pinned down in the middle by the threat (and occasional hit) of the Carthaginian Light Sling Infantry and were sufficiently harassed by the Carthaginian Calvary on the flanks. 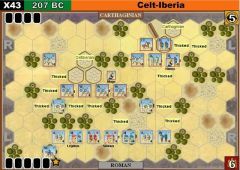 The Roman calvary struggled to do anything productive; the calvary on the left flank struggled for most of the game to stay out of the cold River Trebbia after repeated retreats. 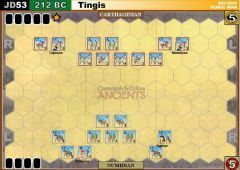 Unlike the previous game the Carthaginians were far more careful with their War Elephants and Heavy Infantry, keeping them outside of ranged attacks, and the patience paid off; the key turning point was when the War Elephants on the Carthaginian left flank saw an opening in the ranks and charged in and destroyed the long Roman Heavy Infantry unit and nearly took out the Medium Infantry unit right next to it. 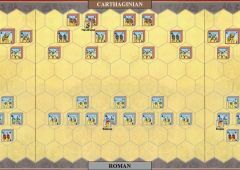 Even though the Elephants were taken down on the next turn, the Roman right flank was basically decimated at that point and all that was left to do was to take out the roman Auxilia (whose inability to evade and lack of support or leadership made them vulnerable to the remaining, superior units of the Carthaginians). 2 games now, and Mago has yet to show up with his ambush force!! 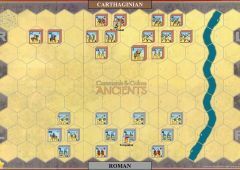 A 7-5 Carthaginian win mostly by tearing down the middle of the map after incurring losses on both flanks due to ranged damage and the skilled Roman medium calvary. 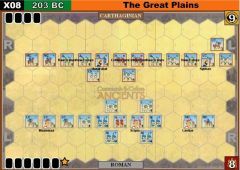 Hannibal himself dispatched the last two units required for victory alongside a medium infantry unit. Mago never joined the battle! 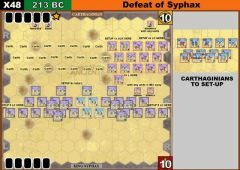 A Carthaginian win, but not as lopsided as in RH. 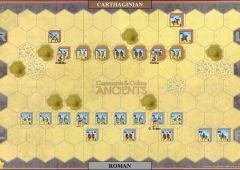 The ambush force never did show up, and the battle turned into a slugging match between the centers that the Carthaginians finally won. Well, Sempronius may have had the greatest performance ever seen in Rome. All seven banners fell to a unit led by him. SIX of them fell after his unit was reduced to a single block. 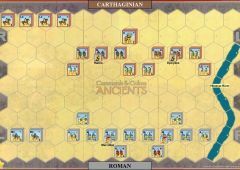 Carthage could not do anything successfully. 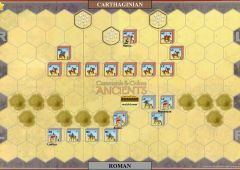 They slowly advanced, pushing their wings forward to hit the Roman flanks, but just could not do anything. Mago's surprise ambush inflicted two blocks of damage instead of the mass damage that was expected to occur. 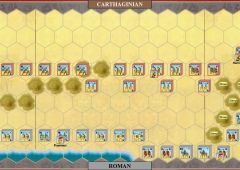 Sempronius' skill was just too great for Carthage to overcome. 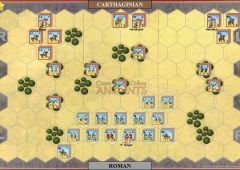 Mago's ambush this time proved much more effective, but aside from his damaging of the Roman flank there weren't many other bright spots for Carthage. 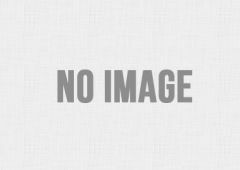 The ambush racked up three quick banners and was responsible for severely weakening a unit that was later picked off. 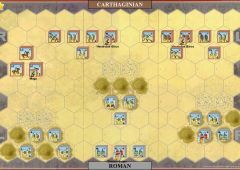 Carthage pushed its left flank cavalry forward in an attempt to break both flanks. Unfortunately this failed miserably with one unit of light cavalry and the elephants eliminated without causing damage. Rome slowly advanced until they closed with the legion. 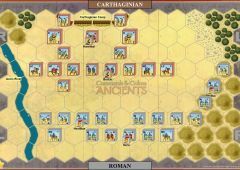 The legion crushed the Carthaginian units and failed to lose any of their own. Seriously, the legion could not be eliminated. It was like a block of terminators in the center that just kept coming.